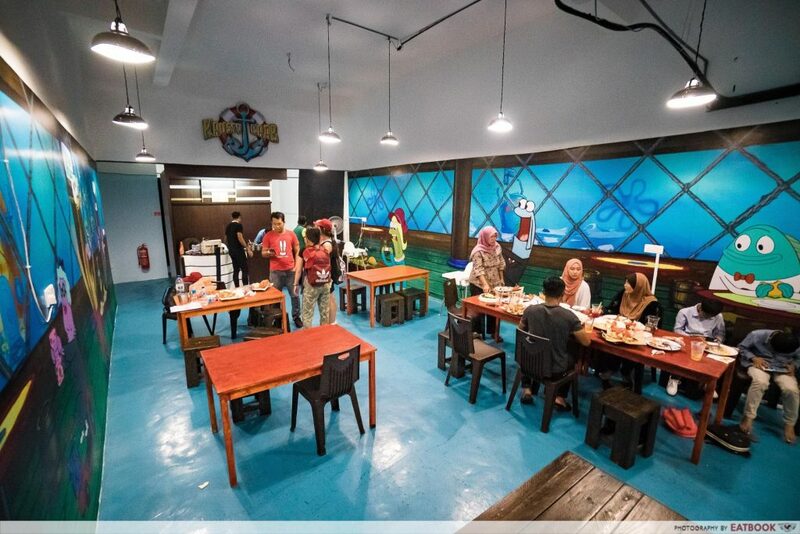 Who would have thought that one day Spongebob Squarepants’ famous Krusty Krab restaurant would come to life? 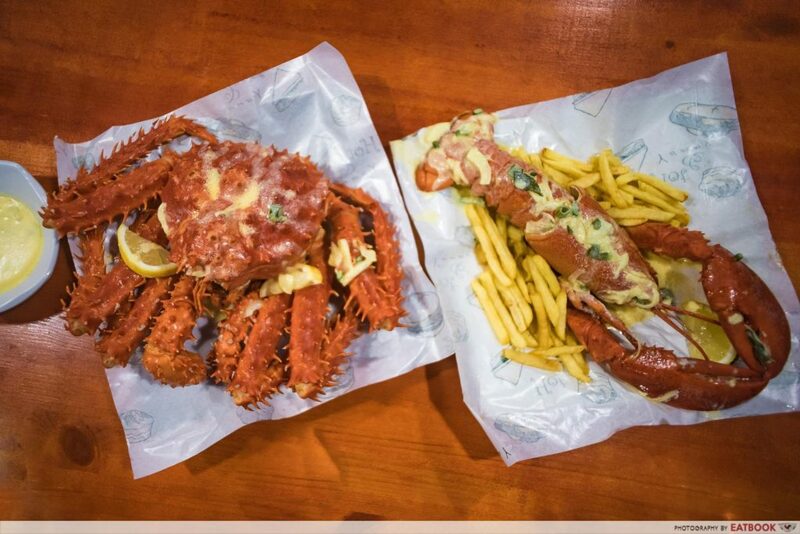 We recently found out about Krusty J Crab, a restaurant in Johor Bahru that offers burgers, lobsters and crabs at prices that would make Mr Krabs weep. 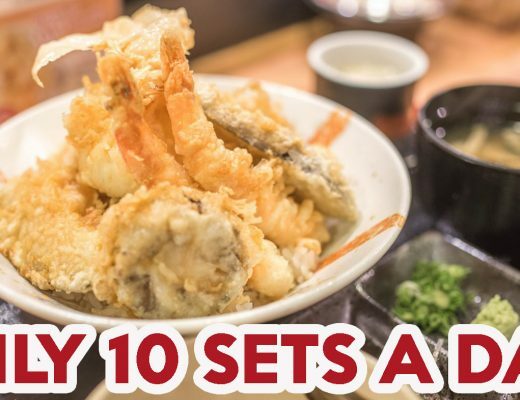 This is a great spot for you to fix those seafood cravings on your next JB jalan jalan. 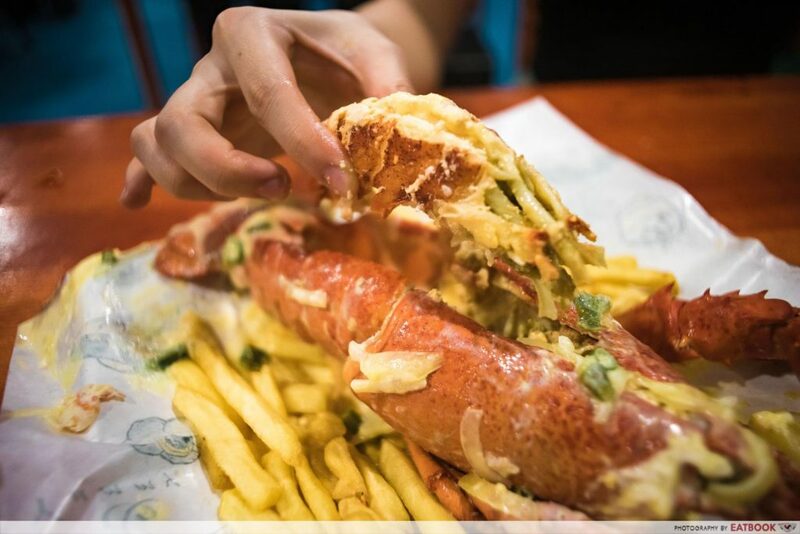 At Krusty J Crab, a variety of lobsters, including Canadian and Malaysian lobsters, awaits your arrival. The lobsters come in set meals, which comprise two plates of nasi lemak with egg, two cups of iced lemon tea, and mineral water. 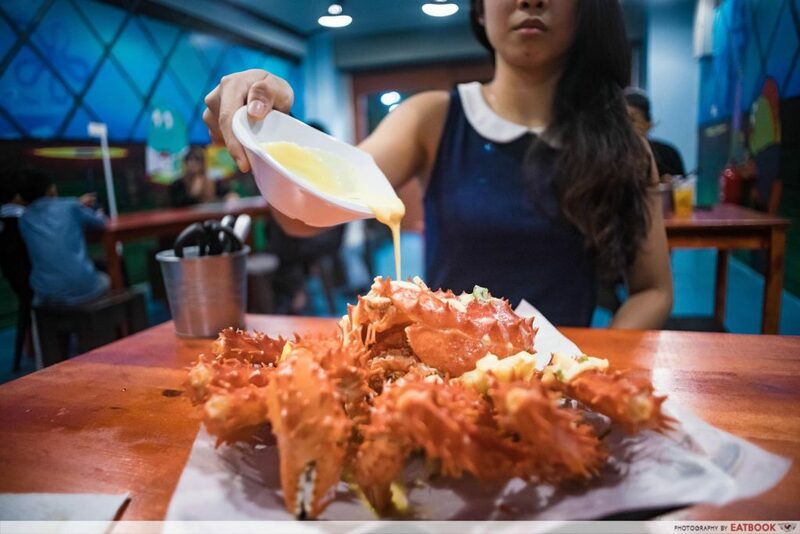 Prices are reasonable, starting at RM129 (~S$43.90) for a medium Canadian lobster (400g to 500g) and you can “upsize” to a large Canadian lobster (520g to 700g) at RM140 (~S$47.60) – that’s only an additional RM11 (~S$3.75)! 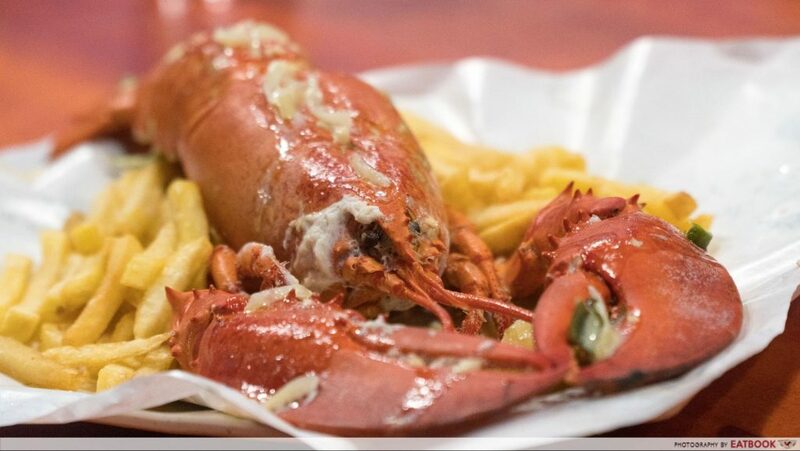 Prices for their seafood are seasonal, so bear in mind that they might be different when you visit. The waiting time for the food tested our patience, but the fresh lobster meat that slid right out of the shell made it all worthwhile. Let’s not forget the lobster claw. Compared to the body, it was of a harder, denser texture and was far saltier. 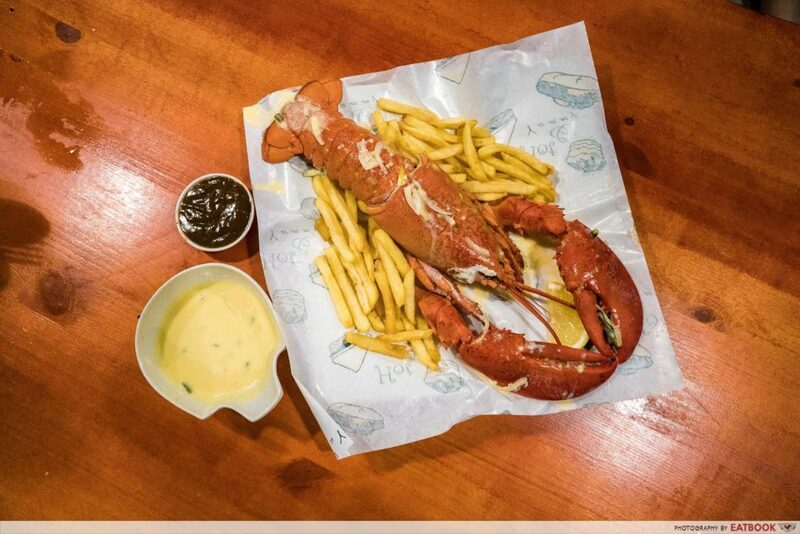 There are two sauces available for the lobster. The first is a creamy housemade butter sauce that brought the lobster to the next level. 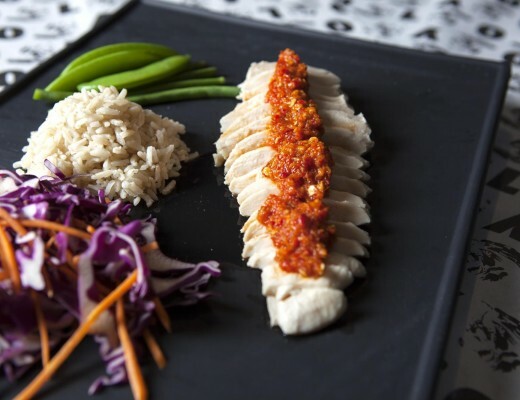 This rich sauce was packed with the flavour and fragrance of garlic, and came with a little kick of spiciness. Even a tiny bit of sauce packed a heavy flavour. The other sauce was black pepper sauce. It paled in comparison to the decadent creamy butter sauce. It would be wise to give it a miss, as there wasn’t anything special about it. Next came our Alaskan Crab. This beast could easily eclipse my face and would be the stuff of nightmares if it were alive and running towards me. Despite being dead, it was still dangerous with spikes that could easily pierce. Alaskan crabs are caught within a short season each year, usually between October and January, so you’ll have to get them while stocks last. 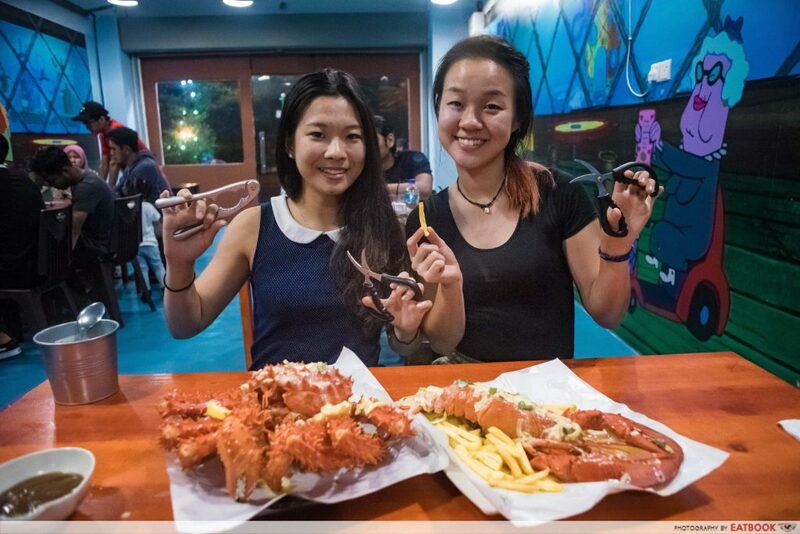 We had a 1.5kg crab, which was considered medium sized and priced at RM374 (~S$127.05). The crab was also served as a set with nasi lemak and drinks. Just like the lobster, the tender crab meat slipped right out of its shell. That being said, we still had to crack open the shell to get the bulk of the meat. The juices of the crab were leaking out from the shell and to my delight, the meat was chewy with a hint of brininess. For those who aren’t keen on seafood, fret not, as they also serve up Krusty Patty Burgers, just like the ones in the cartoon. Customers can choose between chicken and beef at RM12.90 (~S$4.50) and RM13.90 (~S$4.80) respectively. I started with the beef burger. I was impressed by how the burger did not fall apart when I portioned it. 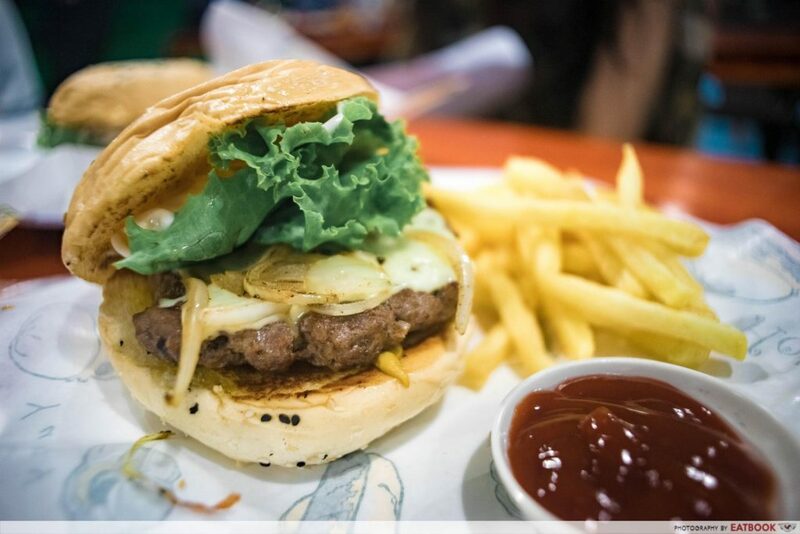 The beef patty was smokey and its juices oozed out as I bit into the soft bun and crunchy vegetables. I didn’t think the chicken could top the beef patty but boy was I surprised by how tender and well-marinated the chicken patty was. It wasn’t a giant nugget like most chicken patties are. It was similar to fresh breast meat, but far more tender, juicier and scrumptious. The barbeque sauce they paired the patty with did not overpower the flavour of the chicken patty. 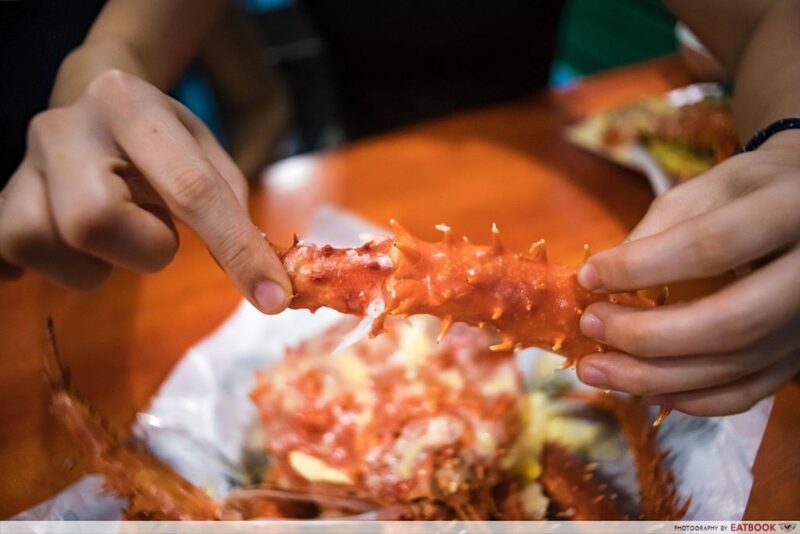 Krusty J Crab is located at a newly renovated area at the northwest of Johor Bahru. It is a family-friendly place great for celebrations and gatherings. 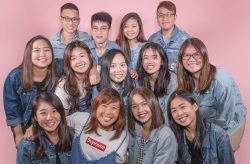 The staff members were friendly and enthusiastic. Plus, they had the cutest uniforms and caps that customers could purchase too. While Krusty J Crab doesn’t serve Italian food, the famous Spongebob Squarepants line, “Ravioli ravioli, give me the formuoli,” still rang in my mind when I was there. Krusty J Crab seems to have figured out the secret formula of Krusty Krab’s Krabby Patty, and made it a reality. 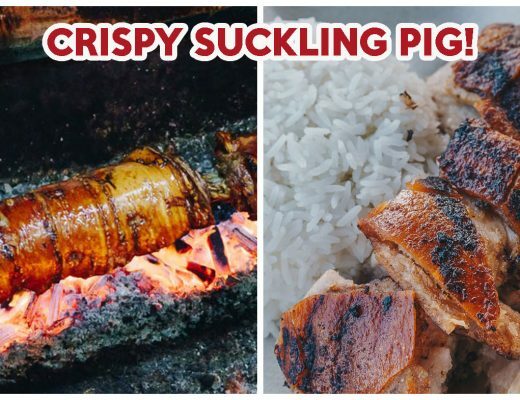 Plus, you can eat like a king here and not burn a huge hole in your wallet! The restaurant is opening a new outlet in June 2018 at No. 7 Jalan Cengkerik 5, Kempas Business Cafe, Johor Bahru. So the next time you’re in JB, remember to check this place out! 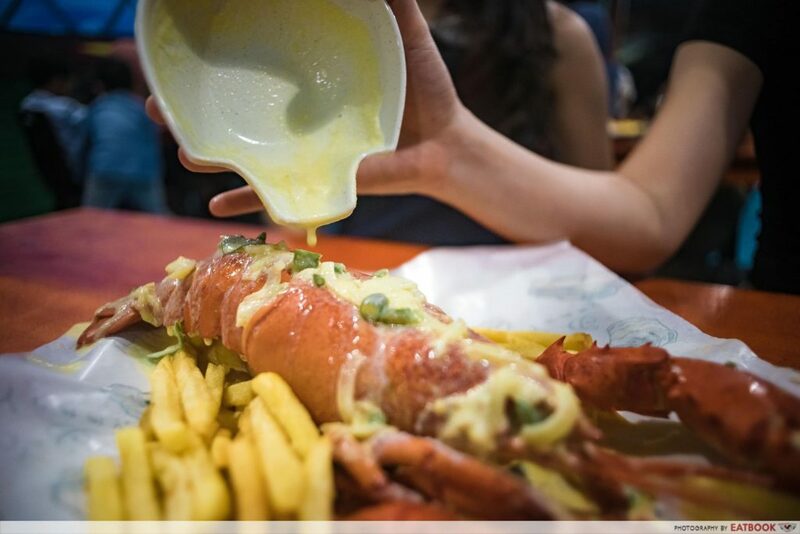 If you’re craving for lobsters but don’t want to leave the country, check out these unique lobster dishes or the lobster laksa at Jurong East! This was a media tasting at Krusty J Crab.